Now that I have the NHP headers with straight mid pipes and Borla S-Type mufflers, it is obviously louder. I'm heading out to AMP for the last DE of the season and they have a sound limit of 96 dB I believe. I'm hoping that I'm not over that limit, but just in case, I'd like to be prepared. 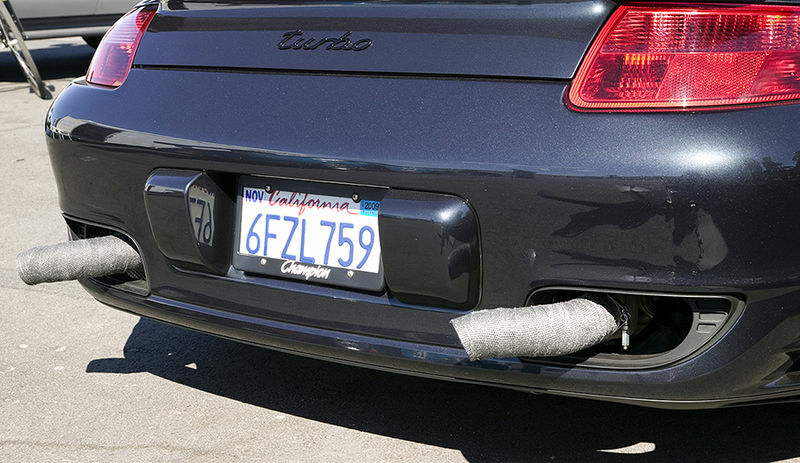 This Borla exhaust is a dual oval tip, and non removable. Is there a solution to redirect the tip downwards on these? a number of exhaust mfgs make turn down tips. 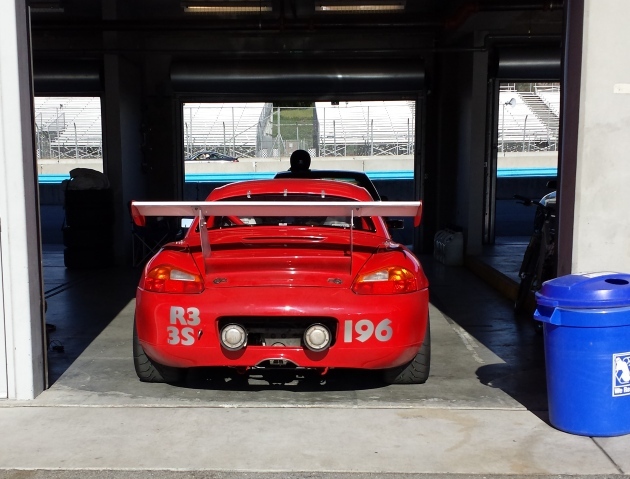 Search the usual suspects like AWE, Fabspeed, TPC, GMG, Sharkwerks, Borla, etc. Or just have a local welder or exhaust shop make one up for you quickly. The typical 95 db limit is a lot louder than you think it might be so you could be w/in spec... download an app from the googelplay or iTunes store to test first. When I drove at LS in '14, they had a 92 dB limit. To get around it, guys had pipes that pointed to the left side of the car (the sound police were on the outside of T5, which was on the passenger side). 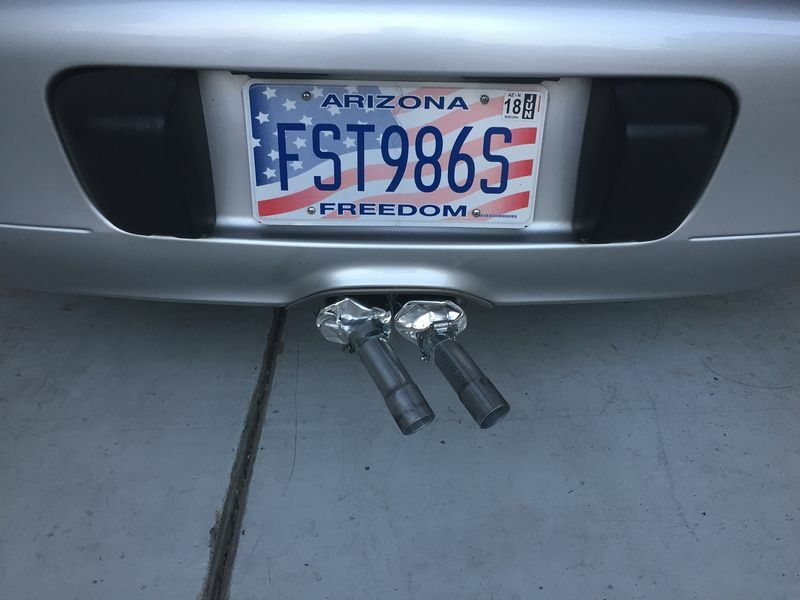 You might want to fab a fart can extension that can be attached to point the sound the other direction. I have my PSE permanently on. I got the black w/ red meatball flag in the 2nd session. Sound police got me at 94 dB. Obviously I couldn't fab a fart can (nor did I want to), so I short shifted by the sound police booth after that. My guess is you'll be over the limit if a stock PSE is 94. Easy solution! Find out where the sound guy is, then short shift or lift when you go by him. Something like this can be quickly put together with materials from Home Depot. Will it help enough to pass 96db? YMMV. 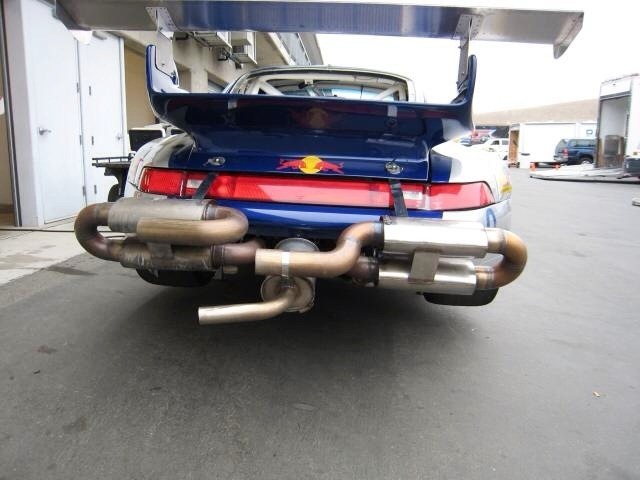 In my experience at Laguna Seca, you might have a chance at making 96db by focusing the sound to the drivers side (and maybe add a bolt on fart can silencer) but the only way to make 92db is to use a stock Boxster muffler. Last edited by thstone; 05-07-2018 at 08:38 PM. 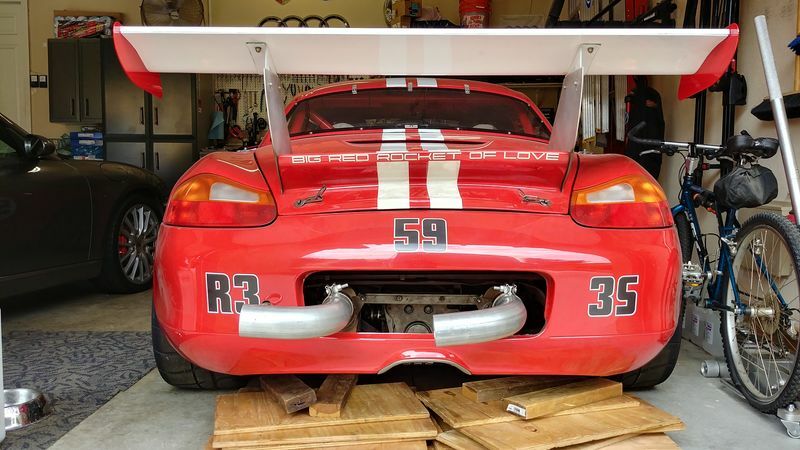 I have two ways of reducing sound on my Boxster. 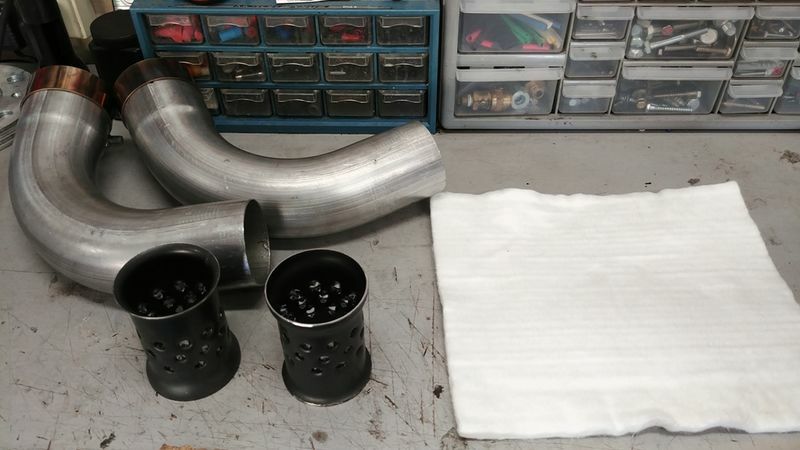 One is a set of supertrapps that bolt on the exhaust and the other is a set of "Laguna pipes" that I built which are essentially angled pipes with a small insert and exhaust packing stuffed in them. The pipes didn't work well enough to pass sound - 92dB was the limit and I was hitting 94-95 dB. The supertrapps were more effective but I still have to lift when going by the sound station. My car without either is at about 98dB wide open. 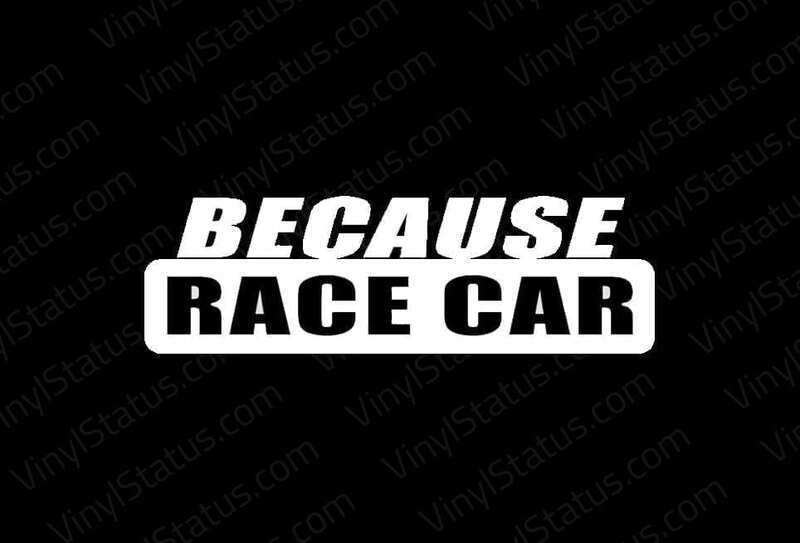 I just always run stock exhaust when running under sound restrictions. Bolt it on and you have a sure thing, vs whack and hope, and maybe go home after 1 session. That looks sweet with the Supertrapps sticking out like that! Here's my fist low budget / in a hurry attempt at turn down tips. I used 45 degree 1 1/2 in ID galvanized exhaust piping elbows, wedged inside the ID of the round pipe in the Borla muffler. 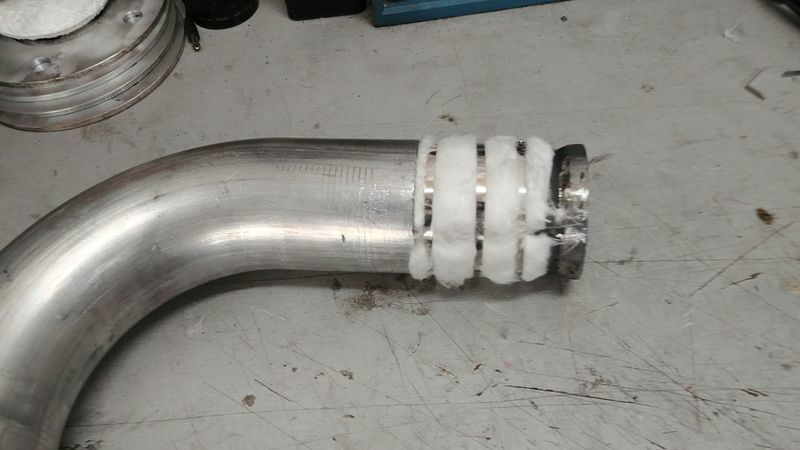 Then I used exhaust patching sheet aluminum (malleable) and fabricated 5in wide by 12 in long pieces that wrap around the oval Borla tip and then around the 1 1/2 in elbow pipe. Then I used hose clamps to attach to both. As you tighten the pipe clamp, it draws in the sheet metal and does a good job at holding the pipe in place. It is not moving. I hope it works well enough for 96 dB. We shall see! Last edited by AZ986S; 05-11-2018 at 06:22 PM. Nice! What ever works, right?